Model, artist, social media darling and reality TV star. But will the real Lauren Tsai please stand up? When I first arrived on set to meet Lauren Tsai, it was halfway through this photoshoot and everyone, including Tsai’s manager, was taking their lunch break in the studio. Tsai, however, was cloistered in the dressing room by herself. I needn’t be told the unspoken rule; the implication was easily read in the way the crew glanced at the shut door — Tsai was not to be disturbed. However, five minutes after my arrival, Tsai came out of the dressing room for a bathroom break. In person, the breakout reality star appears much younger than in pictures. “Model” Tsai exudes cool beauty and moves with calculated grace; “real” Tsai behaves the way a 19-year-old would — slightly awkward, a little shy, but friendly and eager to make a good impression. Tall and lanky, with her hair slicked back, she broke into a cheerful smile as we shook hands, and appeared far from the aloof “It” girl portrayed on social media. In elementary school, Massachusetts-born Tsai had her first taste of modelling, when her 14-year-old sister was signed with IMG and she followed her sister to an audition in New York. Although the experience inspired her to want to model as well, she put it at the back of her mind and didn’t pursue it until several years later, when she was 15 years old and did a short exchange trip to Hiroshima, Japan, for six weeks. 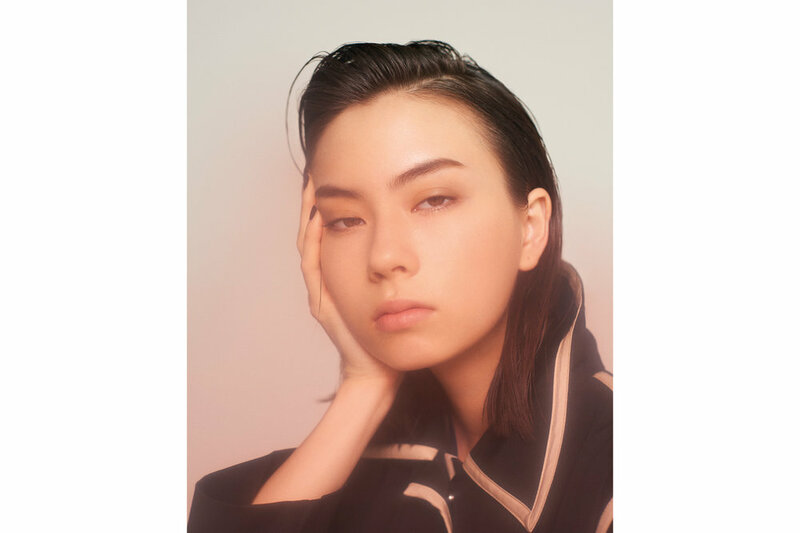 “I discovered Japanese fashion magazines, and all the girls around me were saying, ‘You should try modelling here in Japan!’ so I applied to an agency online,” she recalls candidly. A couple of “embarrassing” and “really bad blurry photos” taken with the Photo Booth programme on her laptop later, she got a call-back from a Tokyo agency, and made the decision to return to Japan the next summer to work as a model. By the time her senior year in high school came about, Tsai was ready to call it quits on modelling and to focus on her first love — art. Being an artist, according to her, was something she always wanted to be since she was a baby. However, modelling and a teenager’s pursuits of wanting to make more friends and going out had taken precedence over art during high school, and it was not until graduation that it “hit” her that art school was where she really wanted to go. “I got everything together, I drew, and I made my entire portfolio within one month,” she says. “I know everyone else had been working on [their portfolios] since sophomore year, so I thought there was no way I am getting into an art college.” However, despite her reservations, she did get accepted into several art colleges. The show turned out to be “Terrace House: Aloha State”, the second season of Netflix’s collaboration with the Japanese “Terrace House” franchise, set in Hawaii. The premise is simple and not wholly original: three young men and three young women stay together in a beautiful house, a la UK’s “Big Brother”. The catch, however, is that all interactions are unscripted. The viewer is the fly on the wall, watching how relationships and alliances are formed organically amongst the six housemates as they go about their daily lives and careers. Being on the show worked out for the best for Tsai. Upon leaving the house, modelling jobs once denied her began pouring in. Amongst others, Tsai has walked for Dolce & Gabbana, appeared on the pages of Nylon and has a featured video on Hypebae.com, fronted campaigns for Uniqlo and Adidas, and most recently, the face of Lumine, a multi-label concept just launched in Singapore. When I asked her whether she ever felt like her multi-cultural background had affected her career, Tsai grew serious. “I felt like I couldn’t find my identity for such a long time growing up in Massachusetts,” she says. “I look Asian, I was the Chinese kid along with my sister. There were other Asian people there too, but I was lucky enough to say that with my parents and the society I was in, I never felt like I have to be aware of the fact that I was Asian, it never mattered. Moving to Hawaii,there was a great mix of people and I definitely felt at home there. And when I’m working in Japan, I’ve never wanted to feel like [my ethnicity] matters, but at the same time, I don’t want to turn away from who I am."